The popularity of satellite maps will be considerably lower if there is no possibility to make measurements in-situ with their help. However, the Google maps are interactive and their possibility to identify coordinates in any point of satellite image gives the possibility to measure length and distance between the objects, to calculate area of buildings and relief forms on earth, radius and area of circle, distance along the road, to measure angles and to define azimuth position. Let's carry out several experiments to test the accuracy of the program for length and areas measurement work. First of all, let's try to make the sample calculation of Australia area. Just in five minutes we create polygon, enveloping the continent and consisting of 258 dots. The task becomes easier due to the fact that all the markers may be dragged and placed in another place. And this is what we get. The continent area, calculated with the help of program, is equal to 7687244.54 square kilometres (2968061.71 square miles). 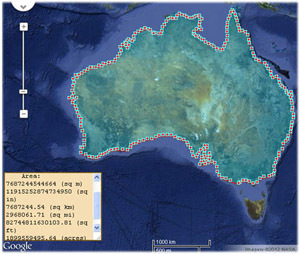 To check our measurements, let's address Wikipedia; it states that "Australia's landmass of 7,617,930 square kilometres (2,941,300 sq mi)". It means that our measurement almost match real values. 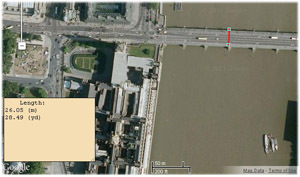 Let's carry out another experiment to define the width of Westminster Bridge over the River Thames (London). We know in advance that its width is 26 meters. Amazing, but the calculated by the program width is 26.05 meters. It means that with the help of maps you may make rather accurate measurement. However, if you need to measure, for example, the area of beach or ravine, or the distance between islands, it is always required to consider the fact that satellite maps are upgraded not very often and natural relief may change from time to time.